Fantastic trail blazer underlining entrepreneurs can be successful at any age. Linda Middleton-Jones is that special brand of pure business magic, and enterprising, inspiring, always leads from the from the front. But always, working to bring out the best in other people. Her breath and knowledge of international trade matters is second to none. 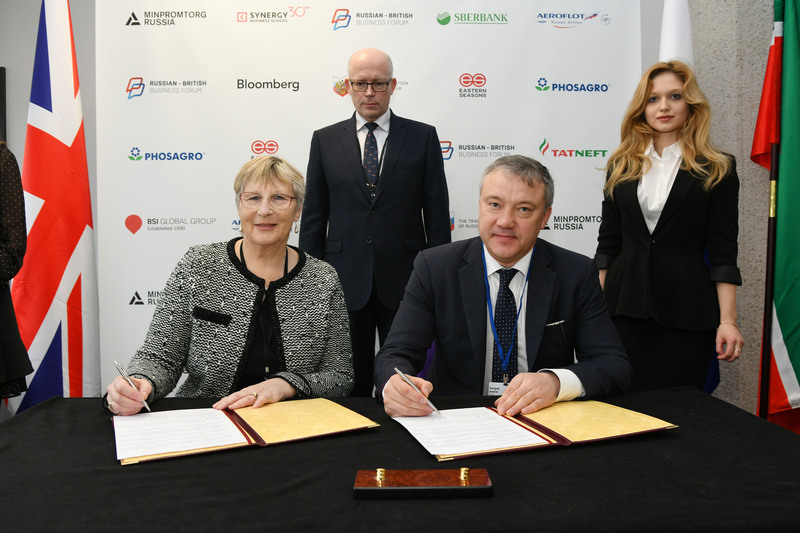 Linda Middleton-Jones led a very successful trade mission to Russia recently to showcase South West and UK companies interested in exporting in that vast market place. She has broken many glass ceilings in her work ethic and approach in business and deserves to be honoured for this award. But especially, is a fantastic role model. Successful, enterprising and always championing the fantastic opportunity for British companies to trade internationally. Linda it"s a like an engine, moving all the wheels around her and very good organizer. A knight in our days. Just an outstanding, energetic woman. I know Linda for many years and there hasn’t been a day without her being involved to drum up some business for others. She was a part of most networking groups in the Southwest for that passion. And it was great to see her starting a business to bring everybody with the same mindset together. Great person, great mind, great effort. Linda is motivated by supporting others, and it's always been a pleasure working with and learning from her over the years. She is both courageous and forward thinking. Linda is one of the most inspiring women I know. I have known her for about 25 years since our days as law students and then through our careers in international trade and beyond. She has always been the most enthusastic ambassador for international trade I know and has a tremendous breadth and depth of knowledge and experience in the field that is second to none. I cannot think of a more worthy winner winner of a trailblazer award for women - Linda is a fantastic role model for women across the UK. Since telling me of her plans to begin an export consultancy 3 years ago, Linda has assembled a team of specialists in export compliance, international sales & marketing and regional cultures, whilst maintaining a personal, small business ethos. She has persevered as a leader in these challenging times for international trade and her company continues to bring great value to clients looking to consolidate or capitalise on overseas opportunities. Linda is an inspiration to everyone who meets her and an important networking partner if you want to make a success of export in the South West. Vision and leadership that drives success of South West businesses overseas, through a group of people improving compliance in international trade. Linda is the very definition of a trailblazer. Carrying the torch for international trade and business in general in the South West, she absolutely deserves to win this award. Linda is a dedicated believer in international trade. She sees solutions, is proactive, knowledgeable and helpful. An asset on any team. Linda continues to promote International trade at every opportunity. This work involves many British organisations who Linda has supported. Her knowledge and dedication to helping companies maximise sales through exporting is endless, only rivalled by her commitment to ensuring companies know the ins and outs of exporting effectively. Linda is incredibly inspiring, and a worthy winner in my book. Linda is insperational to not only just women but to anybody who has the pleasure of meeting her! She’s truly Gods gift to this generation and also inspired by her. Linda works tirelessly to promote International Trade, help business to do it, train them in it and goes on trade missions abroad. She is a supporter of the business community, sitting on the Chamber of Commerce board and others. Linda is an amazing trailblazer in all she does she not only exceeds expectations she also brings along her fellow women. A trailblazer and a light to follow of course she deserves this award. Linda is an inspiration, she works tirelessly for businesses in the Southwest. It is a pleasure working alongside her on the Devon and Chamber board. Linda is extremely knowledgeable in her field and utilizes every opportunity to share this knowledge, often in her own time, and through routes that maximize access to businesses across the SW. She is full of energy, never stops and ensures that she represents the SW businesses Internationally. Linda works tirelessly for her clients, helping them overcome barriers to trade overseas. She has enormous knowledge and a value based approach that ensures all her clients receive exceptional value for money. Linda is clear in what she is seeking to achieve has great focus and if ever there was a time for "it does what it says on the tin" this is a time for voting for Linda to get this award - she is an important person for businesses in the south west! Linda's enthusiasm for supporting more people to enter international trade is infectious. Her passion has opened up a world of possibilities for many individuals and businesses new to exporting. Linda is an immensely inspiring lady who is utterly committed to helping and promoting the world of international trade. Linda gives 100% to every project that she is involved in, and gives up a lot of her spare time to bring together international trade professionals in the South West. We are very proud to have Linda representing the Institute of Export & International Trade. Linda is simply one of the most fabulous people you could ever wish to work with. Her knowledge in the field of international trade is second to none and her innate kindness and empathy means that she is always a pleasure to work with. Linda is tireless in her work on exports and international trade, making her self available to support businesses. She is an inspiration to everyone. Linda is one of the most conscientious and hardworking people I know but always has time for a friendly chat. Without doubt a true trailblazer. Developed a great initiative, tireless in her efforts and has the ability and enthusiasm to make things happen. Linda is a massively positive influence on International Trade in the South West. Linda has supported the Institute of Export with various projects over the last 4 years. She has recently been voted in as Vice Chairman of the IOE Academic Board. Linda is a keen entrepreneur who is focused on international trade and helping companies to do better business. Linda has advised many IOE Members on how to expand their business since being involved with the institute. Her enthusiasm for international trade always surpasses expectations and this is why I believe she deserves this award. Linda is a tireless champion of international trade and a huge asset to the UK. Linda is full of ideas and works hard to see them through, taking the time to interact and support as many people as possible as she does so. A whirlwind of local national and international connections who offers intelligent and insightful support and growth to all levels of businesses/people throughout the South West peninsula on international trade issues. A true trailblazer in her field. Linda works tirelessly to not only promote international trade but also encourages great things from all those around her. Linda is an amazing role model for young women of today. Brilliantly organised, enthusiastic, goal driven and achieving everything she sets her mind to. She first inspired me years ago in Barcelona, and I've never forgotten her drive and enthusiasm to get things done whatever the odds!